I had grand plans to get a bunch of posts scheduled this week, but then last week happened. I tell you, I'm not sure I've ever had so many bad days happen in one week. Here's a taste of what we had to deal with. -I forgot Clyde's circumcision appointment (thankfully we were able to reschedule). -I ran out of gas on the same day that I forgot to bring my wallet (thankfully a sweet gas station attendant loaned me ten dollars of her own money so I could get home!). -I had a really rough day at work. I don't even want to go into it. -I forgot to bring my pump to work on Friday, and it was too late to turn around, so I had to stop by Walmart and buy another one (there goes 30 bucks). -Harvey hurt his leg, and we had to take him to the vet. -I got a flat tire. A nice man helped me change it. Then the spare was flat. I had to wait 1.5 hours in a hot car for AAA to come tow me. We had to buy a whole new set of tires. 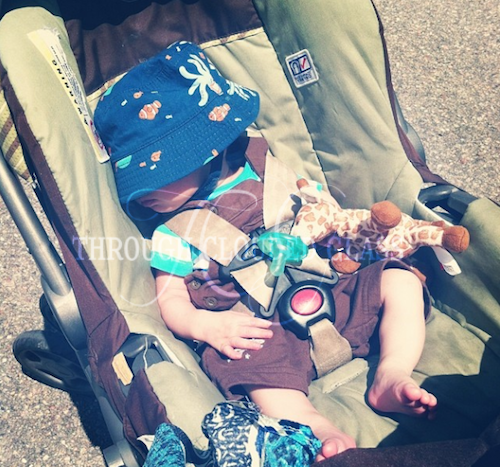 -We decided to wait at a Target across the street for Derek to come pick us up, and we held up an entire line of traffic through a green light trying to cross the street (Wyatt lost his shoe, and I had to carry Gwen, tug Wyatt along, and try to manage a stroller all at once.) I was ready to cut my losses and leave the shoe, but a nice guy ran back and grabbed it for Wyatt. -Gwen almost ruined two outfits (but she loved that ICEE while we were waiting at Target). There were a lot of silver linings and helpful people, and I know it was the Lord trying to tell me everything would be okay! But still, I'm pretty much exhausted. This week Derek is on vacation, and we decided to make it a staycation! We've never had a staycation before, but we decided we better save a little money since we had to spend so much last week. (We also had to get Derek's truck fixed, get our septic tank pumped, and get my camera fixed - that plus the tires and the vet added up to about $2,000. Yuck.) I think it will be fun though, and I'm going to try to treat it like a real vacation as much as possible. So I'm signing out for the whole week after posting this, and I'm not blogging at all. I'll be back next week with a recap! I have read a few of Lis Wiehl's books before, and I've enjoyed every one I've read so far. A Deadly Business was no exception! 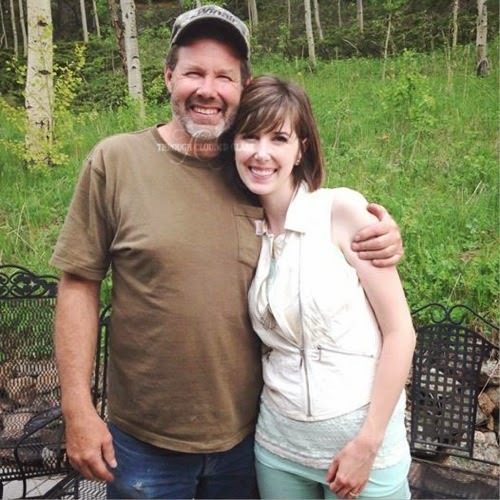 Mia Quinn is struggling to balance it all since her husband Scott died in a car crash months ago. But when she finds out his death may have been murder, and as she unravels some of Scott's deceptions, her life may be in danger as well. I read the first book in the Mia Quinn series a couple years ago, so I was excited to read another book in this series. I could empathize with Mia's character as a mom, and I felt like her struggles to balance taking care of her children with her work life were believable. Wiehl incorporates a couple different plots in this book, the investigation into Scott's murder, and a trial she is working on that involves three juveniles. I felt like the two plot lines were balanced really well, and both were interesting. There is also a subtle romantic triangle developing in the book, and I am curious to see how it plays out. I can't even decide who I want to root for because I thought all of the characters were likable (but I think I'm going with Charlie - we shall see). The ending was exciting and not something I was expecting. Wiehl is great at suspense and knows how to write a good climax. I really enjoyed this book! I'm already looking forward to the next book in this series. Note: I received this book for free from Booklook in exchange for this review. This is my honest opinion. Last year I wrote a series called "Derek And Me" leading up to our five year wedding anniversary. A few weeks later I wrote this post, and I'm not sure why it has taken me so long to share it. I wrote it when my emotions were raw and I was feeling the most insecure about my wifely abilities, but I think so much of it still applies today. I have to try hard in marriage. It's not easy for me. But in the end, I think my effort will be worth it. I'm hoping those of you who can relate will find these "confessions" encouraging! A few weeks ago I wrote my last couple posts in my Derek and Me series, about our wedding vows. I published them, and then a few days later I started second guessing what I wrote, and I took them down and tweaked them a bit before republishing them. I didn't majorly changed them, but the incident made me think about exactly why I felt self-conscious about what I wrote. And I realized one of the reasons I don't write marriage posts that often is because I feel a little insecure in this area. When I thought it through, I realized that I'm insecure because I feel like a failure more in the role of being a wife than in any other role that I occupy. I know I'm a good mom, a good hygienist, a good friend, daughter, etc. But I don't really feel like I'm a good wife. That's how I feel in my role as a wife. I know what kind of wife I want to be. I know the good I should do. But instead I just keep on doing what I don't want to do. I'm hard to live with. I'm bossy. I get irritable, I get snappy, I say things I know I am going to regret. And I hate it. I want so bad to do good for my husband - to be a fun, happy, understanding wife, someone he comes to when he needs a break from the world. I want to be a good wife. But instead I act like someone I wouldn't even want to be around, and I don't know why. I think being a "good wife" comes naturally for some women in their marriage relationships. But it doesn't come naturally for me - in the area of my marriage, my sin nature wins more often than I like to admit. Marriage is hard, not because of Derek at all - he is so understanding and sweet. It's hard because I have such a hard time doing what I know is right in the context of my relationship with Derek. C.S. Lewis said in Mere Christianity that you don't really know how bad you are until you really try to be good. Because you will fail, and you'll see how badly you fail. You can't do the good you want to do without God's help. Paul recognized that he couldn't fully do right in his own power, because his sinful nature was still at work in him. He needed Jesus to deliver him from his sinful nature, and I realize that I need that too! 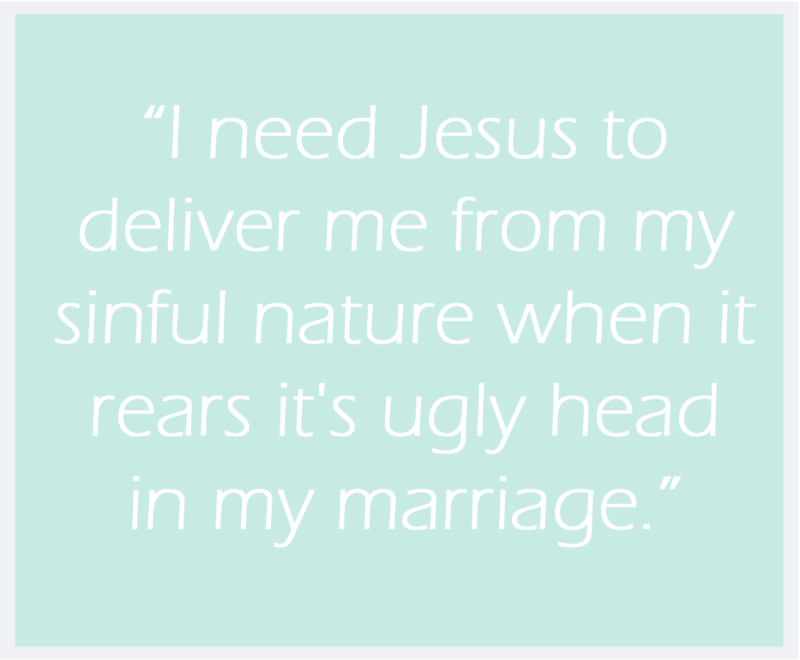 I need Jesus to deliver me from my sinful nature when it rears it's ugly head in my marriage. I won't ever be completely free of it until I reach Heaven, but I think through relying on God's help (and only through relying on His help) and keeping my focus on Him, He can help me do the good I want to do in my marriage more often. And you know, I think because this is an area that is harder for me, in the end I'll get more rewards in Heaven through my struggle to be a good wife than a woman who is naturally a good wife. Everyone has their areas in which they struggle, and though a naturally good wife may not have to struggle to do good in her marriage, she might have to struggle in another area - and she will get her rewards for persevering in whatever that may be. But for me, it gives me hope to think that just because I'm not as naturally good at being a wife as someone else, it doesn't mean I'm a failure. It just means that I have more opportunity for rewards in this area if I continue on and persevere. It means I have an opportunity for character development, because perseverance develops character, and character develops hope (Romans 5:3-4). It means I have this opportunity for growth in my relationship with the Lord, because I have to rely on Him to help me in my marriage - I can't do it by myself. And it gives me more opportunity to know of God's grace - because I am so aware of my failings in this area, it makes it that much more aware of how much I need Him. It makes me realize how amazing it is that the Lord would be willing to save me and love me, wretch that I am. Only when I realize how much I need Him can I truly appreciate what He did for me on the cross! Those who are well (or think they are well) do not need (or don't think they need) a doctor. Those who are sick and know it are the ones who realize how much they need a doctor and appreciate Him that much more. These are the thoughts that keep me trying, even when I feel like a failure. I'm not sure it'll ever be easy for me to show Derek love the way I know I should. But I think the Lord smiles when He sees me turning to Him for help and just trying. And the thought that I might please Him through my attempts, as well as make my marriage better? That makes it worth all the effort. Secrets Of Highly Happy Marriages - Great Book! If you have ever read any of Shaunti Feldhahn's books, you know they are based on surveys she conducts, and then she tells us the results in a book. That is the same way she wrote this book - she interviewed 1000 of the happiest married couples she found, and she shares their "secrets" in The Surprising Secrets Of Highly Happy Marriages. As I was reading each chapter, it felt like I was having epiphany after epiphany. The book shares twelve of the "secrets" of the happiest couples, and I felt like each one was such good, commonsense advice. At the same time, a lot of the secrets weren't things that I had even thought about before. I kept thinking of things that I could do better through each chapter, but what I liked best was that each of these tips is so doable. These aren't vague ideas, they are solid tips that are spelled out very clearly, and there are clear ways to apply them either in action or attitude. They are all relatively easy to apply as well - I like that! As the subtitle says, these are little things that I can already see would make a big difference in the level of happiness in marriage. Shaunti recommends picking one or two secrets to work on at one time, instead of trying to do all of them at once, and I think that is good advice - I was trying to remember all of them through the first half of the book and quickly realized that I wouldn't be able to change everything all at once. So I picked two of the secrets - "Happy Couple Keep Score" and "Happy Couples Think They Hit The Jackpot". Those are the two I'm going to focus on for the first few weeks of trying to apply what I learned here. I think I'll probably have to write more posts about this - I'm definitely feeling inspired after reading this book. Who doesn't want to be as happy as possible in their marriage? I also really appreciated how positive this book is about marriage - happy marriages aren't something you just have if you are lucky, in most cases it is something you can achieve with a little effort. I think this would be inspiring to couples who may be currently struggling, and encouraging and helpful to couples who want to make their marriages as good as they can be. This is probably one of the best marriage books I have ever read. If you are married, or hope to be married someday, you should definitely check it out! Note: I received this book in ebook and print format for free from Blogging For Books in exchange for this review. This is my honest opinion. In Undetected by Dee Hendreson, submarine commander Mark Bishop comes back from his three month patrol at sea to meet up with his friend's younger sister - "Gina the Genius". Gina Grey has been working on sonar science for most of her adult life, and she makes several new discoveries that can contribute to the safety - or the danger - of the submarines like the ones where Mark and her brother spend most of their time. As these discoveries are handled by the Navy she finds herself more in the company of Bishop, and feelings begin to grow. I liked this book - it was interesting to read, and I was impressed with how much in-depth information Henderson included about submarines and sonar. She really seemed to know what she was talking about, and the breakthroughs that Gina discovers in the books were interesting. I found myself wondering if these were real discoveries or if Henderson had just made them up! I liked the way the romance developed between the two main characters. I will say that I was somewhat annoyed with Mark's character during the first part of the book when Gina is dating someone else. He goes out of his way to be fair to the other guy, and I found myself getting irritated with him. Hasn't he ever heard of "it's all fair in love and war"? Go get the girl, don't be setting her up to spend more time with your rival! But I suppose it was honorable, and it all works out in the end anyway. I enjoyed the way the plot and all of Gina's scientific discoveries came together in the end to avert a crisis - I thought it tied the whole book together nicely. The romance story was also finished off nicely at the end of the book. Henderson also cleverly inserted some characters from one of her previous books into this story, and now I'm curious to go back and read that one as well! I'm looking forward to reading more from this series! Note: I received this book for free from Bethany House in exchange for this review. This is my honest opinion. Shortly after Clyde was born I was making our bed, and I found one of those little blue and pink striped hats that they give you at the hospital tucked between the sheets. It wasn't a big thing, but it struck me in that moment that I hadn't seen one of those hats lying around in a while. In a short 16 months all the baby hats, pacifiers, swaddle blankets, and bottles had disappeared from our house, and seeing that baby hat in an unexpected place jolted me. This time is so fleeting. My babies are growing up day to day, and the baby things vanish one by one. I don't recognize the last day I use the hospital baby hat. I don't realize it's the last day we need to use the swaddle blankets. I don't notice the last day my child plays with the baby rattle. I don't notice until it's over. It made me realize again that I have to cherish all those little baby things, because soon all my kids will be toddlers with no little hats to be seen. I need to appreciate all the Hot Wheels cars and princess books scattered around my house right now, because the day will also come when I find a Lego under my couch and realize again that the years sneaked by when I wasn't looking. My house might look like Babies 'R' Us exploded now, but there will come a day when all of these things will just be a memory. I want to notice. I want to see them. I want to remember to love them while my kids are little. While the baby things are here. After my unexpectedly quick labor with Gwen, I knew I wanted to give birth naturally with Clyde. I knew I could do it, and I liked how easy my recovery was after Gwen, so I felt it would be less complicated to give birth without an epidural this time around. However, I also knew that I did not want to go the midwife/birthing center route - I have a good relationship with my OB-GYN, and I feel more comfortable in a hospital. In preparation for giving birth naturally in a hospital I read a lot on the subject, and it was somewhat disheartening. A lot of natural birth resources seem to imply that it is nearly impossible to have a successful natural birth in a hospital setting. I don't believe that. Does it take some strategizing? Yes, I think so. Is it impossible? Not at all! I am definitely not a natural childbirth expert (I don't have any problem with epidurals). I am not a midwife or a doula, I didn't give birth naturally with all of my babies, my babies were all average-sized, and my labors are short. I have it easy in a lot of ways, and I am sure there are a lot of ladies who would have better advice than I'm going to list here. But I wanted to share the things that helped me. Everyone is different, and I want to share my experience in the hope that something here will be helpful to someone else! 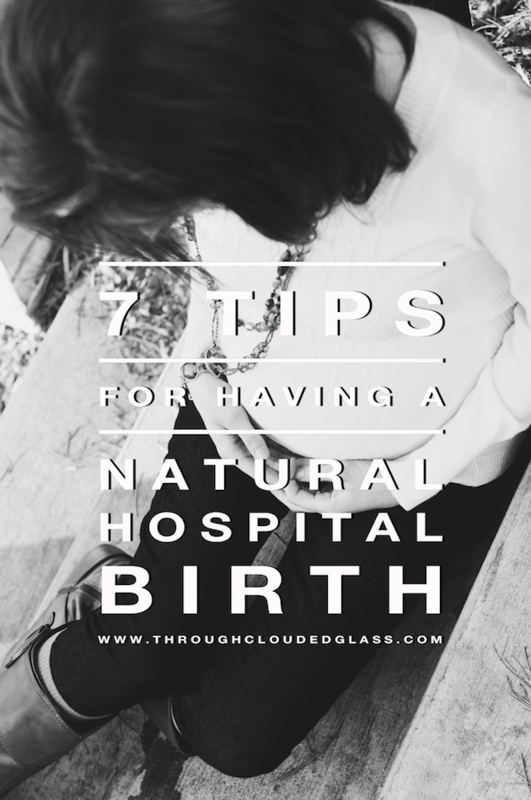 With that said, here are my tips on things you can do to help improve your chances of having a successful natural birth in a hospital setting. 1. Pick your hospital carefully. Not everyone has the option of multiple hospitals, but if you do, I think it's important to pick one that seems natural-birth friendly. I had a choice between two hospitals with this birth. One of them focused on the number of births they had per year and focused on the fact that an anesthesiologist was available 24/7. The other had a pre-admission program where you could go over your birth plan with the nurses, and birthing balls, a jetted tub, and aroma therapy were available. I obviously chose to deliver at the second hospital. There was a clear difference between the two hospitals, and I'm not sure my natural birth would have happened, at least not as smoothly, at the first hospital. 2. Don't go in too soon. This was tricky for me, because as most of you know, I have a history of quick, unpredictable labors! But in my labor with Clyde, my contractions did slow down considerably in the middle. I chose to walk around outside the hospital for a little while to make sure things were progressing before I went in. If I had gone in right away and my contractions had slowed down in the hospital, I think there would have been more of a push for Pitocin. Making sure my labor was well-established was definitely a help. 3. Ask the nurses not to mention the epidural. I was afraid that in the thick of labor I might give in if someone tried to convince me to get the epidural. I told the nurses that I knew an epidural was available, but I would rather they not mention it to me - if I wanted it, I would ask for it. They respected my wishes, which was a big help to me. 4. Don't get stuck in bed. When I gave birth the first time I had to be induced, and one of the worst parts was being stuck in bed, strapped down with the monitors and IV. This time I asked for the wireless monitors so I could move around. They put in an IV, but they didn't have me hooked up to it during my labor. Not being constrained was huge for me. 5. Ask to avoid unnecessary cervical checks. It can be frustrating to hear a lower number than you were expecting, and it gives everyone a (sometimes) unnecessary worry. Unless my labor was excessively long, I decided to ask to avoid cervical checks altogether. I could tell when I was going through transition, so getting constant updates before that point would have been distracting and discouraging to me. 6. Try to relax and focus on things other than your labor. With both of my natural births I had distractions during labor, and it made my labors seem to go by so much faster. Sitting in the hospital focusing on your pain with no distractions is not fun. We watched movies during my labor, and it was such a nice diversion! If your hospital doesn't provide movies, bring your laptop and some DVDs. Choose something funny and make jokes - I think laughing kept things happy and it helped me to relax. 7. Remember that the medical staff is not the enemy. You chose to give birth in a hospital for a reason - maybe because of certain complications, or maybe because you wanted trained medical staff to be available in case there were complications. One of the books I read (Natural Hospital Birth by Cynthia Gabriel) said that in essence, you have hired the hospital staff to look for and treat any complications that arise - so you can't get upset when they try to do their job! Communicate your wishes, try to make sure they are on the same page that you are, get them on your team. Put your foot down if you have to, but try to do it in a nice way. Be flexible if a serious complication does arise. Remember that you chose to give birth in a hospital for a reason. It will go much smoother if you are friendly, and it will be a much better experience if you treat your caregivers like friends instead of enemies. I am so grateful that my delivery went smoothly and I was blessed to be able to apply the above tips - I definitely know from experience that things don't always go so smoothly, and these tips aren't going to be practical for every situation. Labor can be so unpredictable, and things may not always turn out exactly like you want, no matter what you do. I think it's important to be flexible and not let it get to you too much if the unexpected happens. If things don't go as planned, se la vie, and it is okay. However, having a strategy beforehand doesn't hurt, and I think doing these things definitely helped me toward my goal of having a natural birth in the hospital! If anyone has anything to add, I'd love to read your tips below. Note: I'm working on a post with the labor resources that I found useful - stay tuned! In Out Of The Ruins by Karen Barnett, Abby Fischer is determined that her sister will survive her cancer, and she jumps at the chance to have her try an experimental treatment with x-rays. However, her sister dies anyway, and Abby vows to never talk to God again. Then the San Francisco earthquake hits, and Abby struggles with feeling like God has abandoned her yet again. What will show her that God has been taking care of her even through her heartache? To be honest, I found this book a little depressing. Her sister dies, and then there is a bunch of destruction with the earthquake. Throw in a little romance, and that is basically the whole plot of the book. While there is a good lesson as far as Abby learning to trust God and see His provision through tragedy, for me, it didn't quite redeem the general death and destruction that permeated the book. I just would have liked more happy moments in the book, or more of a plot aside from the tragedies that occurred. There was a romance storyline between Abby and her sister's doctor, Dr. King, but it felt a little rushed to me. I would have liked a little more time spent on the development of the romantic interest in the book, and a little less focus on the tragedy. I did think the x-ray study plot element was interesting though, and it made me want to go back and look at the history of x-rays a little more. I cringed when the doctors repeatedly tested the x-ray strength on themselves and received burns from the radiation, thinking it was a good thing. I studied a bit about the history of radiographs as part of hygiene school, and I know that part of the story was probably fairly accurate! I found that interesting. Overall, I didn't mind this book, but I just thought there were a few too many catastrophes without the light-hearted moments to balance it out. I think I have lost my imagination. I recently received the book Sleep Sweet My Little One by Patsy Clairmont, and if there was an imaginative children's book, this is it. The book is basically a conversation with the moon in rhyming form (and I do love rhymes for kids). The little pajama-clad child in the book imagines catching moonbeams, being a planet, sitting on a galaxy throne. He imagines the moon playing with the stars and drinking tea. But I realized while I was reading it to Wyatt that my brain just kept pointing out the scientific inaccuracies! I kept thinking, "The moon doesn't warm anybody's pillow! The stars are their own light source. And there are no rainbows at night!" Yes, I did. That's how dead my imagination is, guys. In all seriousness, I do have to say that since I received this book from Tommy Nelson, I was expecting some reference to God, or a prayer, or something like that in the book, and there wasn't any of that. I wouldn't call this a Christian children's book. I also would rather focus on teaching my kids to pray to Jesus at night than teach them to talk to the moon. The moon is also thanked at one point for it's light and warmth, which I didn't like because I feel like we should be thanking God for the moon, rather than thanking the moon itself, even if it is just a children's book. It's not what I would expect from a Christian author, and combined with a vague reference to Christian mysticism in one of Clairmont's other books, I was a rather disturbed. I will say that the illustrations were imaginative and gorgeous, so that was a positive. If you are looking for something God-focused to read to your kids at night, I would say that isn't the purpose of this book, and you should look elsewhere. If you're looking for something whimsical and imaginative, this could be an option, but if you want my honest opinion, I wasn't a big fan. You can take a look at the book yourself here. Note: I received this book for free from Tommy Nelson in exchange for this review. This is my honest opinion. This last weekend was Father's Day, but we also celebrated my birthday! Even though I accidentally deleted all of my pictures from the weekend (can you believe it? I was so upset), I still wanted to document. On Saturday Derek had plans to take us out for my birthday, and he started out the day by taking the kids to buy me presents. He let them each pick out what they wanted to get me, and he said Gwen pointed to a pack of batteries and said "mama!". So AAA batteries were my first present. I think we need to work on Gwen's present picking skills! Honestly, it was pretty cute though. Then my next gift was a beautiful necklace that Wyatt picked out for me! Clyde and I had a nice morning getting ready, and he gave me the biggest smiles, which I love! Then we took off for town to get an upgrade on my phone. I am very excited about it. My iPhone was a 4 with 8 GB, and it was getting really slow. Now I have a 5C with 32 GB! It is impressive how much faster it is, and the camera is way better quality! After my upgrade and a hurried renewal of my driver's license online (I forgot that it was expiring! ), Derek took me to the new Trader Joe's. We just got one around here. My goal was to find a pear vinaigrette that I had tasted before, but of course they were sold out. So we splurged on pear ginger tea, cookie butter, dark chocolate, orange muscat champagne vinegar, and a basil plant instead! They have a lot of neat stuff there. We're just going to have to go back at some point for my pear vinaigrette. Next we went and picked out a cheesecake for my birthday cake, then got Japanese food for dinner. We picked out a couple movies at Best Buy, but we ended up watching a Jim Gaffigan comedy routine and eating my cheesecake after we got the kids in bed. It was a lovely evening. The next day the kids and I made Derek a Father's Day card, and gave it to him with a homemade coupon for one item of his choice that I would buy for him! Yes, it's kind of cheating. But I wasn't sure exactly what he wanted, and it's hard shopping with three kids. He thought it was a good present though. We went to church, and then afterward we went to see some dinosaur tracks! Yes, there are actual dinosaur tracks in some of the rocks in our area. And this is where I wish I had not lost all my pictures, because I had dinosaur track fossils and dinosaur bone fossils to show you! And pictures of Wyatt and Gwen with the dinosaur fossils! Argh. And pictures next to life-size dinosaur models. Argh again. Anyway, it was a nice birthday celebration and Father's Day! My only wish is that I didn't lose my pictures! It happened when I tried to restore the old backup of my phone, and I've searched the Cloud to no avail. Oh well. You can visit my photo blog (request an invite to the right) or follow me on Instagram for the ones I still have! My DSLR camera that is! I'm not going to lie guys, I feel kind of naked without it. Last week we were at the zoo and a dark line started showing up on my photos. I played around with it a little bit and realized it got darker the higher the ISO, and changing lenses didn't help. My sensor. My poor sensor is dying. I knew this was probably coming since I've been using my camera pretty heavily since I got it 2 1/2 years ago, but I was hoping to have more time. My niece was born last week! Sweet little Chloe. She is pretty much adorable and has the most gorgeous head of dark hair. This is my sister looking perfect after her c-section! How she looks fresh as a daisy after waking up at 4:00 AM and undergoing major surgery is beyond me! And of course this had to happen right before my niece was born. It figures. I pulled out my old point and shoot to use in the meantime and I was reminded of why I took the plunge to buy a DSLR in the first place. It's just not the same. And wouldn't you know, I couldn't find a camera shop around here that fixes Nikons! I'm not sure why. Are they really difficult to fix? Or expensive maybe? I had to send it off to Nikon headquarters, and I'm just praying they don't lose it and can fix it quickly. I need my camera! So it's going to be point-and-shoot and phone photos for a little while. I forgot all my tricks to make my p&s pictures look okay, so I'm going to have a learning curve. I'm feeling lost without it. It's kind of weird to get so attached to an inanimate object, isn't it? Please tell me I'm not the only one! P.S. Please excuse the mess, I'm in the process of tweaking a few thing with my blog design! I Love You All The Same - Review and Giveaway! When I was a child, I used to really enjoy children's books where I could pretend that my brother and sister and I were like the characters in the book. If a story included a girl with a younger brother and sister I usually liked it, because in my mind, it was just like my siblings and me! Well, we recently read I Love You All The Same, and I found myself doing the same thing. In this book, three little bear siblings play together and realize how different they are, but they are reassured and secure in the knowledge that their parents love them equally. While I was reading it to Wyatt, I was thinking the three little bears are just like my three little ones - two boys and a girl! So I told Wyatt it was just like him and Gwen and Clyde. Ever since then he has been carrying the book around, studying it, and wanting to read it every night before bed. It's pretty adorable! I loved this book. The illustrations are cute, and the pages are filled with rhymes. The three bears are a panda bear, a polar bear, and a brown bear, and the book points out their different talents and likes, while the parent bears tell their little ones that while they are all different, they love them all the same. I thought the point of the book was really sweet. While I think this book would be appropriate for any family, I think it would be especially helpful for adoptive families to help their young children understand that even though they are all different, and may have come from different places, God has placed them all in the same family and their parents have the same love for each of them. I definitely recommend this book for parents of multiple little ones! You can take a peek at this book here. Tommy Nelson is kind enough to provide a copy of this book for one of my readers! Fill out the form below for a chance to win a copy! Note: Check out my photo blog for more photos of sweet Clyde, including his precious smile! If you don't have access, you can request to follow my photo blog by clicking on the button to the right and filling out the form. My sweet Clyde boy is 2 months old! I looked at him the other day and told Derek that I thought he had doubled in size in the last two days. All of a sudden he just seems so much bigger! We haven't been to the doctor yet, so I don't know how much he weighs, but I'm really curious to find out. The biggest difference to me is that his legs don't look scrawny anymore. He has filled out a lot. Clyde is in 0-3 month clothes, and still in newborn size diapers. I tried some of his smallest shoes on his feet the other day, and while they looked absolutely adorable, they are still a bit too big! Poor boy still seems to be a bit colicky, on and off. The gas relief drops don't seem to help much, and though we tried probiotic drops, I don't think I was consistent enough for them to make a big difference. We picked up some gripe water, and that seems to be the thing that helped the most, though we still have some rough days. Clyde is a wonderful sleeper! It is such a blessing to have a third baby who sleeps so well. He has been sleeping through the night (i.e. going 8 hours without eating) pretty consistently since he was about a month old! The secret seems to be keeping his room really warm, because if it's too cold he won't sleep well at all. Occasionally he'll have a rough night where he just won't go to sleep (related to his stomach aches), but most of the time he'll go to bed at 8-9 PM, wake up around 4-5 AM, and then sleep another 2-3 hours. Not too shabby at all. Wyatt and Gwen still love Clyde! Gwen will randomly go up and give him a kiss, and if he loses his pacifier she tries to stuff it back in his mouth. She likes to pat him on the head too, and always looks so proud of herself when we tell her she's being sweet to Clyde! Wyatt is also so sweet and gentle with him. The other day he surprised me by asking to hold Clyde again, so I settled him down on the couch with Clyde on his lap. After a little while Clyde started getting fussy, so I was going to try to help Wyatt, but Wyatt held up a hand and said "Let me hold him," and then proceeded to try to calm Clyde down with his pacifier. I thought it was pretty cute that he wanted to take care of Clyde all by himself! Clyde also started smiling on May 13th! He had a couple smiles before then, but we weren't sure they were the real thing - but on the 13th, I knew. He has smiled occasionally over the last month, but in the last week he has been smiling at us so much more! His smile is just too adorable - he has such cute little cheeks, with amazing dimples! I love it. He "talks" to us every now and then, and it's always in such a quiet, sweet way. That is probably how I would describe his personality so far, quiet and sweet. He is also a complete snuggle bug, and he loves to be held. He seems partial to being held by me, but he is starting to be more open about snuggling with other people too! If he can't have me, Derek is his next pick for sure. It is so cute to see him fall asleep in Derek's arms, but I also secretly love that he often wants me to hold him. You are growing, Sweet Boy! I can't believe it's been two months since you joined our family. You are such a sweet baby, and your smile just lights up the room! I think if I had to pick two favorite moments from the past month, having you look at me and smile and try to talk to me is definitely one of them! It's just so adorable, and the little sounds you make are so individual to you. They literally sound like a "coo", and they make me think you have such a gentle, sweet disposition already. My other favorite moment is probably just any time you fall asleep in my arms. I love how you just drape your little arms and legs off to the side and pass out. Or if you are tucked in instead, I love how you snuggle your nose up against my skin. I like feeling your soft hair tickling my chin. I'm so thankful to have you in my life, sweet baby. 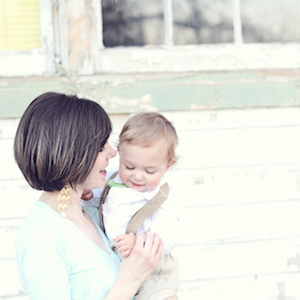 I am so blessed to be your mama. I have to say, I don't make elaborate dinners that often. Cooking is just not something I really enjoy, so whatever meals are quick and easy to make, that is what we usually eat. Every now and then though, I try to make Derek something a little more special for dinner, and a few weeks ago I decided we were due for a nice meal. I scoured my cabinets, and I found a spice packet for Bruschetta Chicken. After reading the recipe on the back though, I decided I didn't like it, so I improvised and came up with a recipe on the fly. I wasn't sure if it was going to be edible, but it was actually delicious! I wrote down the recipe so I could repeat it in the future, and I thought I would share it here! If you want to make the exact same thing, you can buy the McCormick Gourmet Sweet Basil and Oregano Bruschetta Chicken spice packet and use that, but I also came up with a mix of spices that is similar in case you can't find it. Feel free to adjust spices in this list to taste! 1. Mix all ingredients together in a bowl. Set aside. 1. Cook chicken, and cut into slices or chunks. I usually pull chicken breasts out of my freezer and put them straight in the oven. They are usually done after an hour in the oven at 415 degrees Fahrenheit. 2. Pour enough olive oil into a saucepan to cover the bottom. Add minced garlic, bell pepper, onion, and 1/2 spice mix. Cook until peppers and onions are tender. 3. Cook penne noodles according to package directions. Drain and set aside. 4. Add chicken to peppers and onions, and coat in oil and spices. 5. Add milk and flour to mixture. Lower heat and simmer until the sauce starts to thicken. 6. Add mozzarella cheese and stir until melted. 7. Pour sauce mixture and the remainder of the spice mixture onto noodles and mix well. Serve warm. Variation: We liked the noodles just following the above steps, but if you want this to be more like a casserole, you can also pour the noodles into a baking dish, add mozzarella cheese on top, and bake until the cheese is melted. 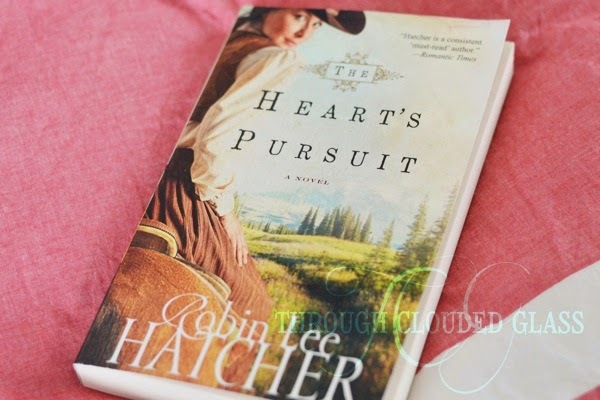 In The Heart's Pursuit by Robin Lee Hatcher, Silver Matlock has been left at the alter and her parents have been robbed by her former fiancé. In desperation, she hires a bounty hunter and secretly joins him as they search for Silver's ex-fiance. However, Jared Newman has his own agenda - finding the man who murdered his family years ago. As they hunt for these criminals, feelings start to develop between them. I enjoyed this book. I felt like it started out a little slow for me, but the plot picked up toward the middle of the book, and the ending was good. The storyline was interesting, and I liked how the two main character's separate goals end up intertwining as the book goes on. The characters were likable, though I would have liked to read more of the characters' histories, to get to know them better. The one thing that bothered me - and I don't want to say too much to avoid giving anything away - was that I felt like the villain's character wasn't consistent toward the end. I just would have expected such a ruthless killer to choose to act differently at the climax of the book. I also felt like a decision that Silver made toward the end of the book was a little over-the-top foolish, and because of that it didn't feel realistic to me. I think I am overanalyzing though, because overall I liked the book. This was just a light, old west romance. It was an enjoyable read, not too deep, with a happy ending (and I always like a happy ending)! 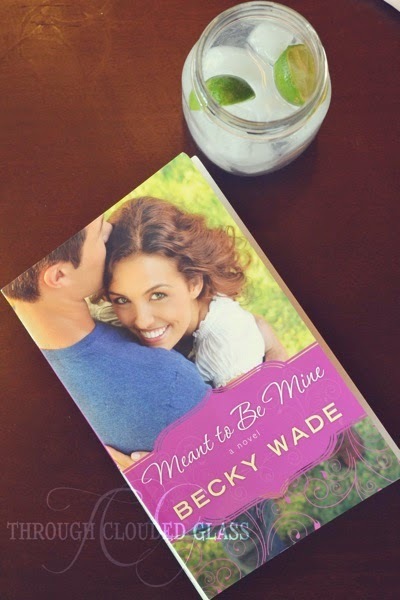 In Meant To Be Mine by Becky Wade, Ty and Celia who knew each other in high school, run into each other in Las Vegas and get married on a whim. Celia has been in love with Ty for years and is happy about their marriage, but he regrets their hasty decision the next morning and leaves Celia heartbroken. Years later Ty tracks down Celia to apologize for what happened in Vegas, and finds out Celia has a child - but Celia is not happy to see him. There were things I liked about this book, and a couple things that annoyed me slightly. Ty was described as perfectly handsome, and I felt like the author tried to describe his looks as too perfect. I don't like my fictional characters to be too perfect. I also felt like he was too perfectly confident (translate: cocky), and used too much flattery on the women in the book (I think it was supposed to show you how smooth he was, but it just made me think "fake" or "misleading"). His only flaws were in his reckless nature (which could also seem exciting, depending on the spin the author puts on it), and in a tendency for chemical addiction (but not too much, because he is able to resist). I liked the joking banter between Ty and Celia, and that was what kept me liking his character. Everything else was just too perfect. Ty and Celia, later in the book, also decide that it's okay to kiss each other, even though they aren't really dating and Celia has no plans at forming a real relationship with him at that point. I thought that was a little morally off, and the characters never really figured out why. Ty and Celia, later in the book, also decide that it's okay to kiss each other, even though they aren't really dating andly off, and the characters never really figured out why. I thought Celia's character was quirky and likable, and her daughter was adorable (which is a funny thing to write about a fictional child, but it is true). I would have liked to read more interactions with the daughter later in the book, since they seemed to taper off a bit as the story revolved around Ty and Celia. I also liked the secondary characters - they were all quirky and likable, really. I thought the author did a great job of keeping the plot interesting throughout the book, without inserting too much drama. I liked how she inserted the stories of Celia and Ty's faith, how they returned to following God, in such a natural way. The relationship was developed subtly until the end of the book, and I always think it takes some talent to progress character development that way. The ending was really good, and I liked the sacrifice that was made at the end. Overall, I think this is an interesting Christian romance book. There were a couple things that bugged me, but I still enjoyed it. It would be a great poolside read for the summer months. I had seen a couple clips of Jim Gaffigan's comedy routines before, so when I saw Dad Is Fat was up for review I decided I'd like to read it. I always appreciate a book that can make me laugh, and I was hoping that would be the case with this book. First, I have to say that I don't necessarily agree with or like all of the jokes in this book, and I was a little disappointed at some of the language. I also thought some of his jokes about Jesus and the Bible were irreverent, and I didn't like that. Aside from those things, I did think most of the book was pretty hilarious! I was laughing out loud at something in every chapter. Gaffigan is a father to five children, and his comedy mostly centers around family life - the trials and ridiculous situations parents are thrown into, the funny things kids do, and they way they change our lives. Though sometimes his jokes seem to focus on the negatives, you can definitely tell after reading the book that he loves his family. I thought this book was a nice break during the day, and it brought out the humor that I had never thought about before in so many common parenting situations. The chapter on toddlers was probably my favorite, because that is where I am in life right now and it was so spot-on and funny! I think most parents of young kids can find something to laugh about in this book, so if you are looking for something humorous to read, I'd recommend checking it out. Note: I received this book for free from Blogging For Books in exchange for this review. This is my honest opinion. I like baths more than showers. Normally my bath time routine involves filling up the tub with the hottest water the spout will give me, soaking and reading for a while, then blow drying my hair. Then I either watch something short on Netflix or listen to a podcast while I straighten my hair (if you haven't guessed, I have to work this in while the kids are napping!). It's my "me-time", my favorite way to relax. I think submission means being willing to take a step back and let your husband be the leader. This is going to look differently and vary in difficulty depending on the situation, and I'm also not going to pretend that there aren't men that sometimes abuse this concept (which is probably why this is such a sticking point for so many Christian women). There are a few things I think submission does not mean. I don't think submission means that you never state your opinion. Being a submissive wife doesn't mean you have to roll over and be a doormat. It doesn't mean you do something morally wrong or questionable in an effort to be submissive. It doesn't mean your husband controls your every move. It definitely does not mean you remain in a dangerous or abusive situation in an effort to "submit". As for what I do think submission means - I think when this aspect of marriage is done right, the wife and husband are both able to discuss and express their thoughts on a situation, and the husband will listen to what his wife has to say. A man who loves his wife and who is wise will not dismiss his wife's thoughts or disregard her feelings on a matter. For the wife, submission means being willing to let go - not always insisting on having things "her way". It means actively letting her husband lead the family, even in those times when she disagrees, even sometimes when the husband may not be handling the situation in the best way. Submission doesn't mean that marriage is not a partnership - both people's opinions do matter, and options should be discussed! But no organization works well without a head. If a business has two presidents and the presidents disagree on a big decision, things could get ugly pretty quickly. The business might split. There has to be a head leader, the one who makes the final decision when not everyone is in agreement. As Christian wives we are called to step back and let our husband be in that position. He'll be the "president" of the family. It doesn't mean the wife's thoughts and opinions don't matter, but the "business" of the family needs an official leader, someone who has the final say. There can't be two "heads" if things are going to run smoothly. This isn't easy! I think it's a natural tendency for a lot of women to want to control things (especially our husbands). The Bible even tells us that women will struggle with this. We want that control, and that's why submission is so hard. I can say all of this with my head as I sit here typing, but it's a lot harder in practicality. I am a bit of a control freak myself. I direct too much. I demand my own way too much. I get angry when Derek disagrees with me. Even when I do the right thing and take the step back, I am definitely ready to jump right back in and remind him of what I said if it later becomes apparent that I was right. I am not "good" at submission - I'm still working on it, but I want to improve because I want to obey God here. I want to make Him proud of me. When I let my husband lead, without any ulterior motives, without trying to manipulate or control things, without looking for my chance to show the superiority of my position later, I think God smiles down at me. I think it's important to also recognize that submission doesn't just involve your relationship with your husband. It involves your relationship with God. He is the one who tells us that the man should be the leader of the family. For some reason the culture has us thinking that it is a sign of weakness to be the one to concede the point, the one to "give in" when there is a disagreement. I would beg to differ. I think it takes a pretty strong, secure woman to realize that God has organized the family this way for a reason. When we allow our husbands to lead, we are ultimately not choosing to "obey" our husbands - we are choosing to trust and obey God. That is not weak. That is brave. It is strong. Even though it might be scary, and things might not always turn out like we want, God will reward us in the end for following His word when it comes to submission. I don't know about you, but I want my reward, and the thought of that is what keeps me trying to do better. I think those treasures in Heaven will be worth not getting my way sometimes while I'm here. For more good insights on submission, including the biblical basis and practical encouragement, I highly recommend this book (and I'm not being paid to say that)! I grew up with the idea of submission, and I still got a lot of new thoughts out of it, so I think it would be helpful for women of any background who want to study this subject more deeply and get a biblical perspective on it. For all you Christian ladies out there, is this an area in which you struggle? What has helped you with the idea of submission? I'd love to hear your thoughts! I've been a little MIA this week, and that is because the kids and I have a horrible cold! 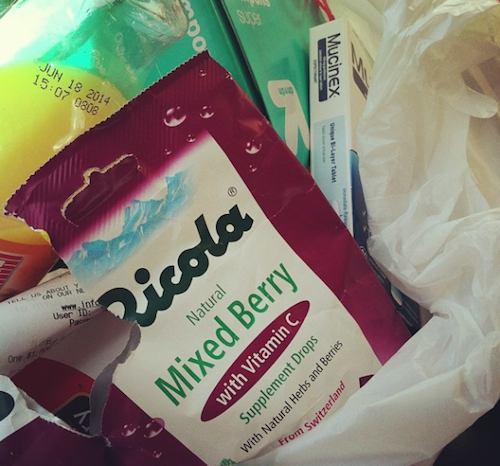 Not just a head cold, more of a head+chest congestion+achy muscles kind of cold. And of course we all had to come down with it at once. I really don't know what I would do if Derek wasn't here right now, because I've been feeling miserable. As in sit-on-the-couch-without-sleeping-thinking-about-how-miserable-I-feel miserable. Thankfully we seem to be on the downward slope, as evidenced by the fact that I am actually typing out a blog post! Aside from The Cold, not much has been going on. We went to a doctor's appointment for Gwen on Monday and I made the mistake of not letting her bring her blankie in. I just don't trust those medical building floors. She cried the whole time, and wailed "dain-dee" (which is how she pronounces "blankie"), and collapsed on the floor whenever I required her to walk, while other patrons stopped and laughed about how I have my hands full. One lady actually offered to help me to my car. That's how pathetic and frazzled I looked. My mom says that I should cut her blanket in half (because of course she picked the biggest blanket she had as the blankie), and I think after the doctor's office incident I just might do it. That way she can take the one piece in, and I can give her the other piece in the car while I stash the contaminated portion to wash later. I also wanted to let you all know that I have adjusted my photo blog concept a bit. I found out that Blogger apparently has a limit on the number of readers you can have for a private blog - bleh! So I made my photo blog public, but just hid it to search engines. I don't want to link directly to the blog from here, so I'll still have you fill out a request form if you want access, and then I'll send you the link (see the button on the right for the request form)! I'm hoping this will make it a little easier for you all to follow as well. If you already requested to follow it, I sent you an e-mail, so check your inbox or e-mail me again! Wyatt: "We're going to go to the zoo!" Me: *laugh* "You want to go to the zoo?" Me (realizing my mistake): "Oh, we can't go to the zoo today, honey." Me (in an effort to avert an incident): "We'll go to the zoo soon though, okay? We'll go soon." Wyatt: "Yay, we'll go to the zoo soon!" My friends, "soon" has finally come. I had to push off "soon" too many times. Any more promises of "soon" and the first "soon" will turn into a lie. I already feel guilty about it, so it's this Friday for sure! I think The Cold should have left us by then. P.S. Follow me on Instagram to keep up with me on the days I don't blog!